As part of Luminate festival and the Scottish International Storytelling Festival, Jan Bee Brown spins yarns from around the world inspired by the Daughters of Penelope exhibition, with Broughton Spinners as special guests. 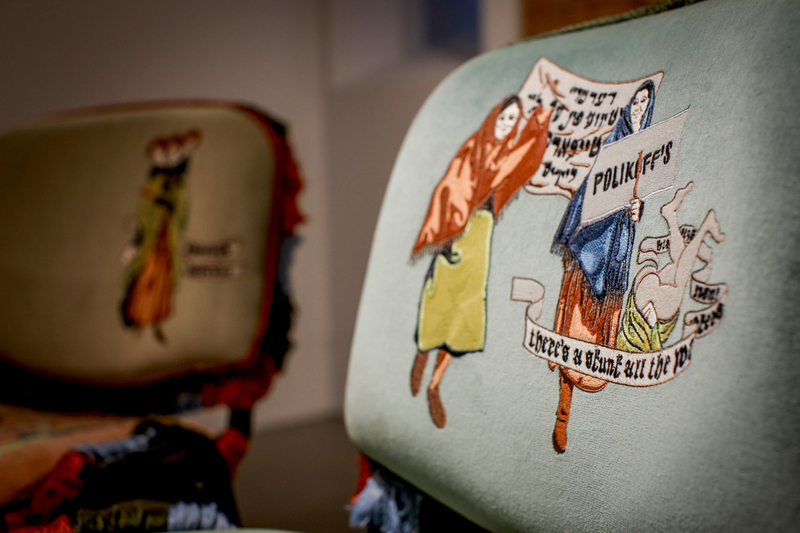 Jan Bee Brown will be sharing stories inspired by the Daughters of Penelope exhibition. From sewing nettle shirts for seven swans to an eight legged spidery curse passed down the generations, come and hear Jan weave her stories of sleeping princesses and tricky tricksters, then join in and make a spider diagram to help you tell your own spooky stories just in time for Hallowe’en. The Broughton Spinners will demonstrate traditional spinning skills. Perfect fun for all the family; grandparents and children can enjoy the stories as well as trying to spin a yarn for themselves! Jan is an apprentice storyteller who loves to weave stories around exhibitions. Following 30 years as a professional textile artist, curator and theatre designer and a year as Reader in Residence with The Scottish Book Trust in Falkirk, Jan joined the apprentice storytelling scheme with the Scottish Storytelling Centre in Edinburgh.The Broughton Spinners are based in the Scottish Borders, and first became involved with Dovecot during the making of ‘The Large Tree Tapestry’ with Victoria Crowe. This event will have hearing loop amplifier kits can be used with T loop option too. Due to limited number of kits, please let us know if you require one in advance. FREE I Please register via Eventbrite.